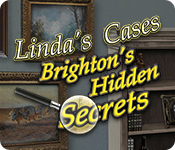 Linda's Cases: Brighton's Hidden Secrets is rated 2.6 out of 5 by 10. Rated 5 out of 5 by cathybobcat from WHAT A WAY TO GO.....CRAZY This was originally released last November 2017 by goGameo....wow... BF was a little behind indeed, but better late than never. This is an excellent game for memory skills. Not only are scenes repeated, there are also the same items to find sometimes. Exceptional. You also get a zoom feature on your mouse to see those hard to find items. I don't know what I would have done without it. The graphics are outstanding, a little old school, but quite colorful and artistic. To add to the enjoyment is a continual loop of moody jazz music with only a few notes...just the type for putting me over the top. It added class to the game. The simplicity of the game is so refreshing and relaxing. It is very conducive to those days when I am feeling brain dead. Rated 4 out of 5 by smwood8 from Simple, but Fun I love the actual Hidden Object games, not the dark fantasy tales that have a few hidden object pages, but that you have to look at Hints to find out where you need to click next. This games is simple, but fun. Good for past-time entertainment. Rated 4 out of 5 by Uppity_Pup from Old School HOG I enjoy this type of hidden object game where you play several scenes and then it repeats scenes while throwing in another new one periodically. There is a zoom option for smaller items, which worked fine although items weren't quite as crisp and clear as they could have been. Still, I had no problem finding objects. On the negative side, there is no option for casual play. There is a timer that goes down fairly quick, but you can continue to finish the level even after time runs out. You just don't get the extra points. That being said, I found no use for the points in the time I played the demo. I will probably buy this game when Big Fish has a BOGO sale. I just don't think it's worth a full price purchase. Rated 3 out of 5 by lamp_post from Strange Little Game This really is not a bad game but it is not my cup of tea. It did take me a little while to figure out how to play the game after entering my name. You must click on the tutorial (question mark). Once I did that it played smoothly but I found it somewhat boring. The music is repetitive and their is no voice overs...just reading what is being said. Try the demo and you might like it. It does have some different features from you standard HO games. Rated 2 out of 5 by MaryD1215 from Definitely Not My Kind of Game This is a nice little game for beginners, I guess. For me, large penalties for a misclick simply irritates me so much I can't play the game. Again, in my opinion, beginners may like this game but I don't see it as much fun for an experienced player. Rated 2 out of 5 by judy76073 from Yes, very old style HOG game I've only done about 1/2 of the demo so far - this one looks like it came out of the archives from about 15 yrs ago. very simplistic, nothing exciting, just straight finding objects listed. Meh! might be worth using a PCC on just for something to fill in the gap until the next HOPA CE game on Thursday. Besides, I have to use up my pcc's before they all expire ! Good for a time when you really just want a non-thinking type of game to play to pass some time. Rated 2 out of 5 by 0Jade from Just find stuff If all you like is finding stuff, you could like this game. It does not have a relax mode, but if you run out of time, no harm, no foul, just fewer points.. You repeat many of the scenes, but you'll be finding things you have found before plus additional items. Some are quite tricky. You can zoom in and out for those playing on a device, so that's nice, and they are fairly generous (at least in the beginning) with hints. Storyline shows up comic book style in call out boxes, and between each scene is a tiny bit more of the story about your friend not showing up to meet you. I never turn off the music it games and it never bothers me. This music was so repetitive, it became annoying. I'm not gonna do it, but you might enjoy. Give it a try. Rated 2 out of 5 by pennmom36 from SAME SCENES, SAME ITEMS IN THE SAME EXACT PLACES I must admit that this could have been a solid Hidden Object game but it has too many flaws. I'll be honest, I didn't pay attention to the storyline because it wasn't that interesting and I got tired of having to click through several dialog boxes between scenes. 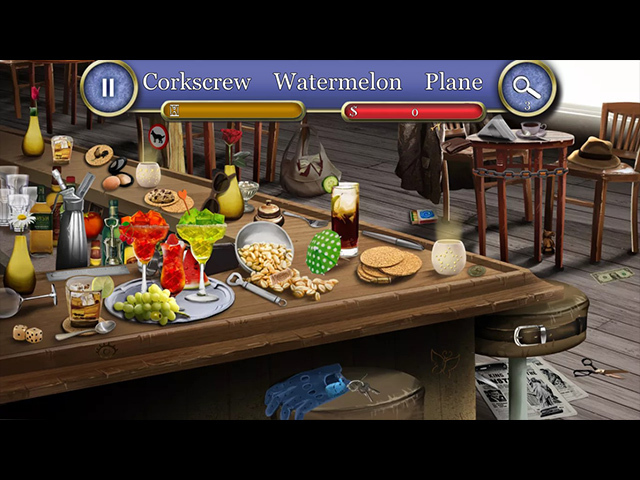 This is a Timed Mode Hidden Object Game that doesn't have an option for a Relaxed, untimed mode, however, you aren't penalized if you don't finish the scene within the allotted time frame (which is ridiculously short) you just won't receive the extra points. The first flaw or poor design was forcing me to go through the motions of a tutorial which forced me to use a Hint just for the sake of using it to learn how to click it, a feature that annoys me to no end! I played the entire demo and sped through several level scenes and was never shown what the points I earned are used for. There's nothing to buy with them so I suppose you just earn points or lose them for no apparent rhyme or reason? When I say lose points, you will be deducted -50 points for wrong selections which in itself isn't so bad but this game has a zoom and drag feature and I was deducted points several times for dragging the screen around, because I had to click first and then drag it, -50 points were often deducted. I had to make sure I clicked on an area that didn't have any items before attempting this feature...a big flaw! The items to find are repeated over and over, the same scenes are repeated over and over (I seemed to spend a lot of my investigation time at the bar, hey, it's a tough job) The style usually changes each time with Listed Items, Pictured Items and Silhouetted Shape Item finds, but those have major flaws, at least the Silhouetted Shape flaws do. It's nearly impossible to find an item that matches a silhouetted shape when the silhouetted shape is square, rectangular or round because there are several objects that are that shape, posters, letters, cookies, donuts, coins etc. I was shown a square shape on the bedroom scene which turned out to be a rectangular Joker card! On the bar scene, it showed a pie shaped object with a curved bottom, yet it wasn't the exact same shaped slice of watermelon! Super-annoying flaw! My final Flaw report is that the graphics are blurry, especially when you zoomed in to a scene. They decided at one point to add fog. 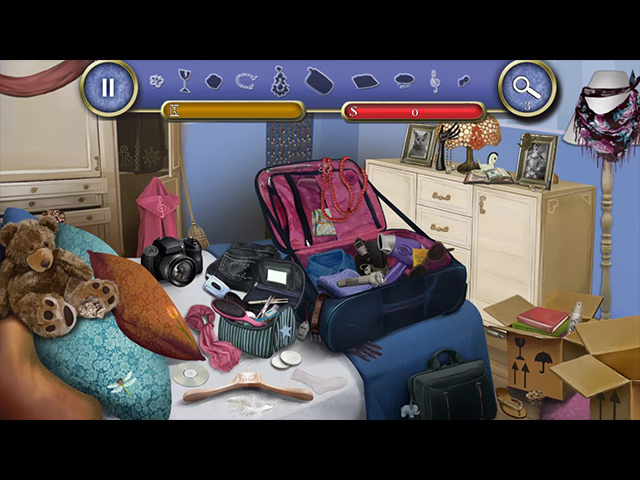 Finding hidden objects because they are well-blended is one thing, trying to find objects that are hidden only because you can't distinguish one item from the next is not fun, it's simply a flaw! Rated 1 out of 5 by gladysschmuck from Another day. Another game that's too dark to see. Butterfly? Really? Where? Oh, down there in the dark. Yes, I know my monitor is dark but goodness sakes, objects should be cleverly hidden not so dark you can't find them even with the hint. Grrrrrrrrrrrrrrrrrr. 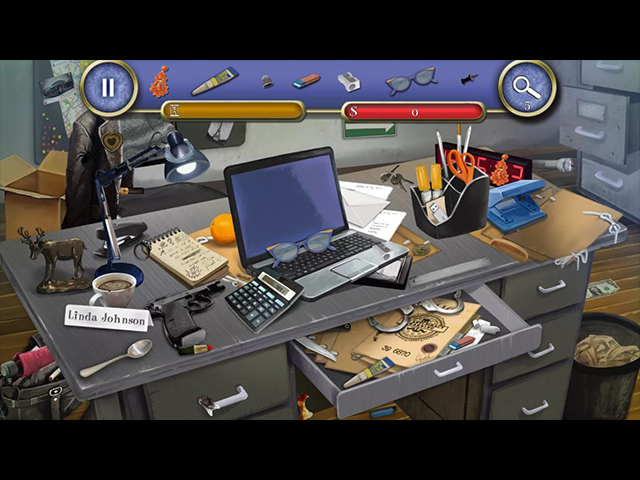 Rated 1 out of 5 by CyndiLouWho2 from Even the preview video is boring If you like straight forward old school hidden object finding with a zoom-able feature, then you will enjoy this game. Just be aware that the timer runs down really fast and there's no way to play the game without it. I'm not fond of the timer thing because I play these types of games for the relaxation. I'm also not crazy about the 'zoom' thing. Why not make all the items clear and large enough to see? Having to zoom in on a fuzzy object eats up your time but maybe that's the whole idea -- you're not supposed to succeed. Lastly, the graphics are flat and downright boring to look at. For me, Brighton's Hidden Secrets can stay that way.